From time to time, the Cari McGee Real Estate Team runs contests as a way of giving back to our friends, fans and followers while also increasing our visibility in the community. The following is a list of rules and guidelines that apply to the our contests. 1.) When we conduct a contest on Facebook, the contest is in no way sponsored, endorsed or administered by, or associated with, Facebook. By participating in our Facebook contests and promotions, you agree to a complete release of Facebook from any claims. We will contact you via the information you’ve shared with us if you win the contest. We may send you occasional marketing messages. You may unsubscribe from these at any time via a link that will be included in every email we send. We will NOT share your contact information with any third party, unless you specifically give us permission to as part of the contest, or if it’s required as part of the contest. You must get permission from the person you’re referring before sharing his/her contact information with the Cari McGee Real Estate Team. 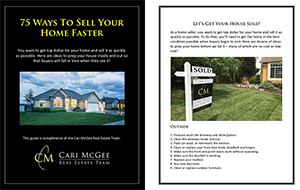 The person being referred must meet with Cari or a member of the Cari McGee Real Estate Team to discuss either the purchase or sale of real estate. Once we make that personal connection with the person you referred, you get credit for the referral! If one or both of those bullet points isn’t met, we can’t give credit/contest entries for the referral. 4.) We never run contests that require the purchase/sale of real estate in order to enter a contest, or to increase your chances of winning. 5.) We never run contests that require you to review us online in order to enter a contest, or to increase your chances of winning. Any additional rules and guidelines will be posted each time we run a contest. Thanks for your interest in our contests and best of luck to all who enter!